Trouble is a board game manufactured by Milton Bradley that involves trying to move tokens of the color that a player chooses from his home space to the finish line. One of the unique features of the Trouble game is the method with which the die is rolled. It is done by pushing the pop-o-matic cube in the center of the game which pops the die into the air, sending it into a roll. Trouble is a game that can be played by two to four players as there are four sets of colored pegs. Each player receives four pegs of the same color and places them in the appropriately marked home space for his color. If only two players play, each can control two colors individually; otherwise, each player only gets one color. To get out of the home space, a player has to roll a six. To roll the die, the player pushes down on the pop-o-matic in the center of the board. If he fails to roll a six, the turn passes to the next player. If a player rolls a six, he can place his piece on the first space next to his home starting position and push the pop-o-matic and move that many spaces. Any time a player rolls a six he gets an additional roll. 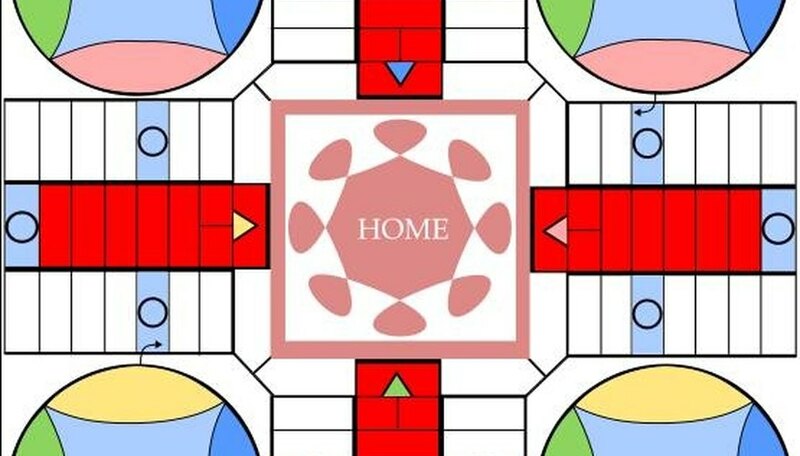 The player may move a piece from his home space to the starting space any times he rolls a six, or move another piece six spaces instead. Movement of the playing pieces in Trouble must be done in a clockwise pattern around the table; pieces can not move backwards. If a player lands on a piece of another player, he can then remove that player's game piece from the board and return it to that player's home space. For a piece to complete its path around the game board, it must end up crossing the finish line that is the same color as the piece. Players must land on the finish line space exactly. In other words, if a player is four spaces from his own finish line space, he must roll a four exactly, or he can not cross the finish line. He can move closer to the line if he rolls less than a four. The first player to get all four of his colored tokens to his own finish line space is the winner in Trouble. If the game is being played by two players and each are controlling colors, the winner must get all eight tokens into their appropriate finish spaces. If you are playing that way with two players, each color must still end up at at the finish line matching the color of the token.